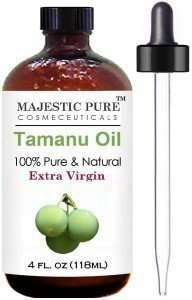 Tamanu oil is an excellent oil for use on damaged skin. It is one of the best anti aging oils for skin care and features prominently in many skin care products. Tamanu oil is referred to by many other names with the most common being foraha oil, green gold and beauty leaf oil. It’s derived from the nuts of the Calophyllum inophyllum (Tamanu nut tree), which is found in East Africa, parts of Asia, Australia, Melanesian and Polynesian islands. 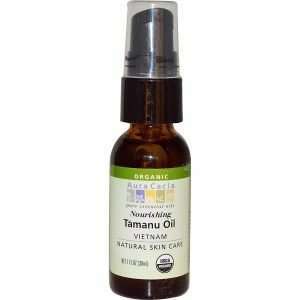 Traditionally, tamanu oil was used to resolve skin issues in Indonesia, Philippines, Jamaica & Papau New Guinea. The tamanu tree produces clusters of sphere-shaped green fruit inside which the nuts are found. The nuts are extracted and dried in the sun for 8 weeks until it becomes sticky with a pleasant smelling oil. The nuts are then cold pressed for the greenish-yellow oil. The smell of tamanu oil is quite pungent; similar to mustard seed oil. Tamanu oil contains anti-inflammatory, antifungal and antimicrobial properties, which helps heal acne and treat common oily skin issues. Use with the oil cleansing method. 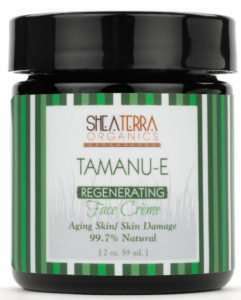 Tamanu oil helps heals damaged skin and helps refine the appearance of scars and wrinkles by promoting cell regeneration and renewal. It also redness, skin irritation and itching. Tamanu oil treats and reduces severe skin conditioners such as dermatitis, eczema, psoriasis and rosacea. This also makes it an excellent oil for scalp conditions such as psoriasis and eczema. 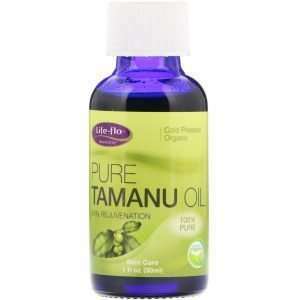 Additionally, research has shown the successful use of tamanu oil for healing severe skin conditions. 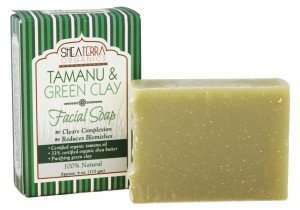 Does Tamanu Oil Clog Pores? Tamanu oil has a comedogenic rating of 2, which means it’s unlikely to clog pores. It is also one of the best oils for oily skin. Read Top 30 Non Comedogenic Oils for Oily Skin. 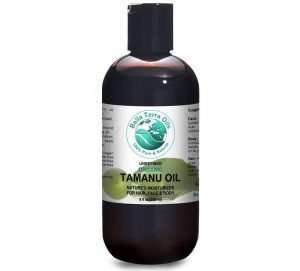 Apply tamanu oil twice a day to scars caused by scrapes, burns, rashes and other skin conditions. The scars should begin to lighten and gently fade away. 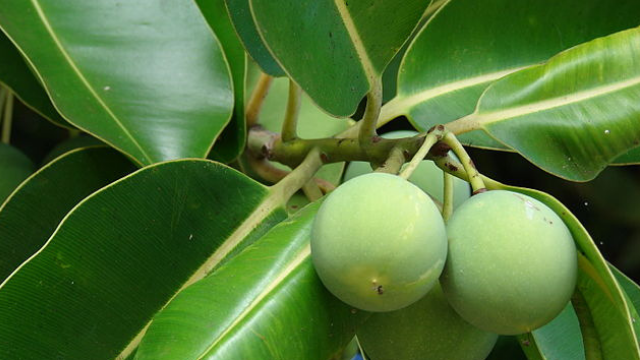 Tamanu oil contains xanthones and coumarins, which are effective inhibitors to free radical damage. Consider including it in your DIY natural sunscreen. If you have puffy eyes and under eye circles, dab 1 – 2 drops of tamanu oil under your eyes before going to bed every day. Apply tamanu oil to your skin while pregnant to prevent stretch marks from occurring. If you already have stretch marks, you can apply as well twice a day. 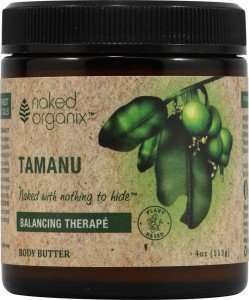 Add tamanu oil to your regular body butter. 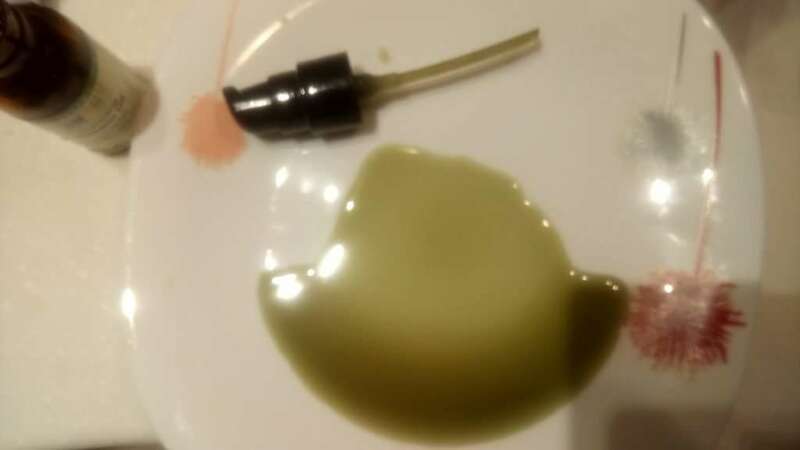 I use it in my body oil recipe. I use this body oil in the evenings after a shower. I also use it in my body butter recipe. Tamanu oil is considered a nut oil so if you have a nut allergy, you may want to try another oil for skin care. If unsure, conduct a patch test before using tamanu oil for the first time. 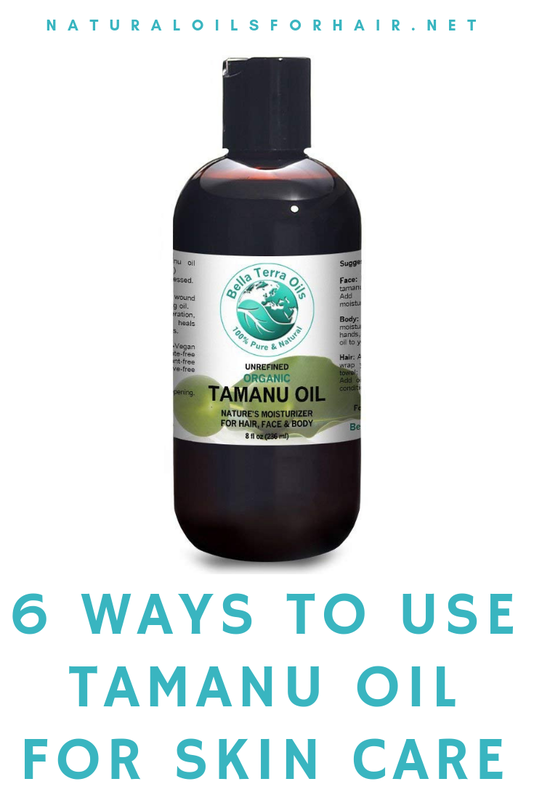 Where to Buy Tamanu Oil? Tamanu oil might appear greasy initially but absorbs into the skin quickly, leaving behind a clean surface. In most cases, a few drops are all you need ensuring a bottle will last for a long time. Think the same amount of argan oil you use. Using more will not make it more effective and could irritate your skin.